The creators of the movie 701 are offering a $100,000 reward for the “best proof that UFOs are real.” They’ll accept “photograph, video footage, film footage or debris,” but whatever proof is submitted will have to “withstand scientific scrutiny by our chosen panel.” This challenge is sure to spur on creative types who’ll leap at the chance to put together interesting photographs or video footage in an attempt to win the prize. The piece of “debris” might be a little more difficult to submit, but some crafty individuals will probably be able to piece together something interesting as a submission. The winner of the challenge can remain anonymous or make an appearance in the film. The 701 film appears to be a faux UFO documentary of sorts, but it’s still in the very early stages of development and information on the exact details is scarce. It’s website states that “701 is the number the government does not want you to know about.” It goes on to describe famous UFO incidents from the 1940’s and 50’s, presenting both the idea that they were actual aliens from another planet and the counter argument that they were simple things like errant weather balloons. The short description on the website concludes with “What if BOTH sides were wrong?” The brevity of the summary leaves a lot to the imagination. The project was started by filmmaker James Fox, who created Out of the Blue, a 2002 documentary that examines several UFO reports. It’s follow up documentary I know What I Saw expands on the testimony in the first film. It’s also being written by science fiction screenwriter Tracy Torme (Contact,Star Trek: The Next Generation, Sliders), so it’s already mixing elements of fact and fiction right out of the gate. Though it is initially being billed as a ‘drama’, the filmmakers are taking a lot of steps towards interviewing real life UFO experts. They’ve supposedly been interviewing people involved with Project Blue Book, which is a collection of over 12,000 UFO reports. Most of these reports have been attributed to naturally occurring phenomenons. But a small portion of them couldn’t be explained. How many? 701, of course. And those reports are presumably what the film is going to be about. Whether this investigation into the real life conspiracy theory means that creative submissions for the project will be discarded or not isn’t clear. They will be held up to “scrutiny,” but there are a lot of talented people out there that can work magic with a camera. 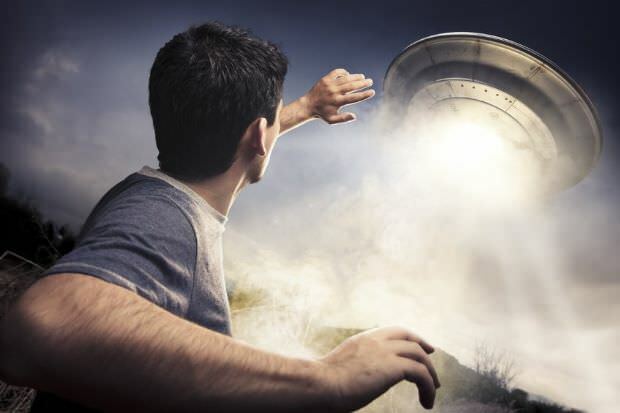 People have been faking UFO photos and video since the phenomenon began and with $100,000 on the line many more will probably follow suit. If a winner is chosen, it’s up to them if they want to play along and pretend it’s real or show off their amazing photography or video editing skills. The details on the contest page are, just like the rest of the website, too brief to come to any definitive conclusions. The estimated release date of the film is April 2014. There is no deadline listed for the contest.